With over 30 years of industry experience, we’re experts at renovating aging, cracked concrete floors and turning them into polished concrete flooring masterpieces. Using specialized diamond concrete grinding equipment, we remove paint, glue, mastic and other unsightly matter leaving a clean smooth surface. Transform that dull damaged concrete to a work of art. 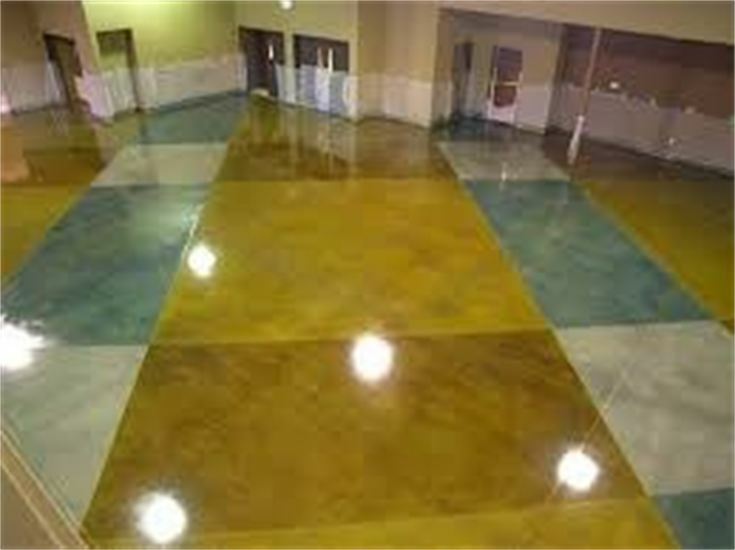 Stained concrete is a great alternative to other flooring options. And in basements, stained concrete provides the perfect flooring….it’s kid, pet and spill proof. We have the right concrete refinishing machines to refinish, hone, stain & polish concrete floors. This job in Roswell needed complete rehab. Layers of paint and glue covered the concrete surface. We used our 800-pound concrete grinder and special diamonds to cut through the mess. After the rough concrete grinding, we honed the concrete with 30grit, 60grit, 100grit and last 150grit leaving a smooth concrete surface. Sealing & burnishing the concrete leaves a very durable, easy-to clean concrete floor that is both long lasting & affordable. Polished concrete flooring offers many advantages over traditional home or office floor options. Not only is it easy-to-clean, but it is stronger than other flooring alternatives and also eco-friendly. Commercial and industrial facilities benefit from concrete polishing because it meets OSHA guidelines due to its non-slip characteristics. Beats concrete polishing involves a refined process that incorporates polished concrete technology with the only two-component concrete guard on the market. This guard system outlasts traditional guards hands down. One of the most innovative systems to hit the flooring industry in years, polished concrete does have some limitations. When many contractors choose polished concrete, in most cases they are doing so without really understanding the maintenance that polished concrete must receive to maintain its luster. We now use high performance guards to hold up to everyday use without needing to be reapplied every month or so. Burnishing is no longer necessary to keep that shine so you’ll save time and money after application. Our process includes applying and burnishing the concrete guard after polishing the concrete. This guard acts as a sacrificial protective layer and must be reapplied frequently to keep the concrete protected and shiny. Traditional concrete guards do not hold up well to acidic or caustic materials and liquids, which cause premature failure and staining. 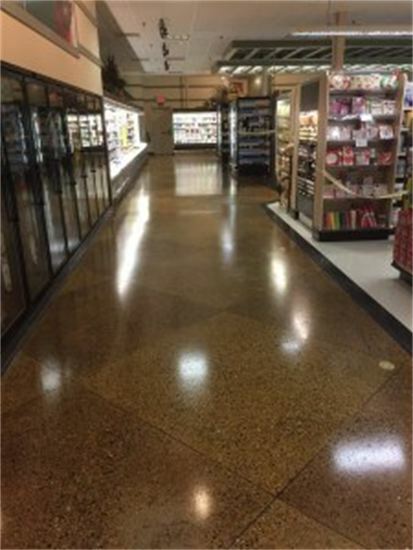 Here’s an example of a store that needed our 2-step concrete guard surface protection for their polished & stained concrete floors. Their maintenance schedule included applying a topical single component system every two months and then burnishing it into the floor’s surface. Even with their best efforts at maintenance, this floor would not keep its luster. It continued to stain, especially when broken items fell off of store shelving. 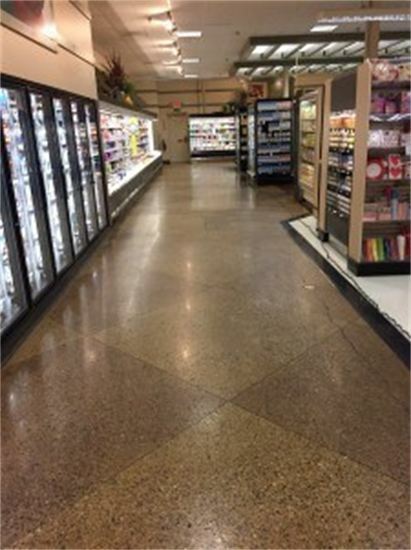 Here is the same store’s concrete floors after applying the high performance two-component guard system. No more burnishing every few months to keep the floor looking good. This system lasts longer and looks better than standard polished concrete. Better yet, there’s no need for re-application. ...and in most cases, may be installed for less money and time than traditional polished concrete. 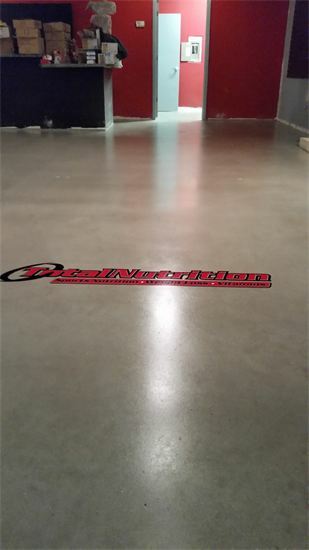 If you're tired of applying concrete guard, need an existing floor polished or would like a new polished concrete floor installed, give us a call or send us an email.